Copyright 2014 The Authors-This is an open access article under the terms of the Creative Commons Attribution-NonCommercial-NoDerivs License, (CC BY-NC-ND 2.0 AU) which permits use and distribution in any medium, provided the original work is properly cited, the use is non-commercial and no modifications or adaptations are made. Background: Care provided by student doctors and nurses is well received by patients in hospital and primary care settings. Whether the same is true for aged care residents of nursing homes with mild cognitive decline and their family members is unknown. 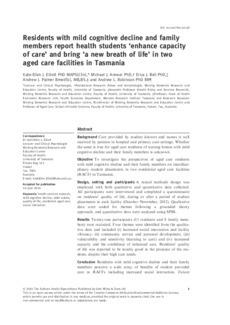 Objective: To investigate the perspectives of aged care residents with mild cognitive decline and their family members on interdisciplinary student placements in two residential aged care facilities (RACF) in Tasmania. Design, setting and participants: A mixed methods design was employed with both qualitative and quantitative data collected. All participants were interviewed and completed a questionnaire on residents' quality of life, during or after a period of student placements in each facility (October-November, 2012). Qualitative data were coded for themes following a grounded theory approach, and quantitative data were analysed using SPSS. Results: Twenty-one participants (13 residents and 8 family members) were recruited. Four themes were identified from the qualitative data and included (i) increased social interaction and facility vibrancy; (ii) community service and personal development, (iii) vulnerability and sensitivity (learning to care) and (iv) increased capacity and the confidence of enhanced care. Residents' quality of life was reported to be mostly good in the presence of the students, despite their high care needs. Conclusion: Residents with mild cognitive decline and their family members perceive a wide array of benefits of student provided care in RACFs including increased social interaction. Future quantitative research should focus on whether changes in care occur for residents as a result of student involvement. © 2014 John Wiley & Sons Ltd.